Lots of news and previews coming out of the bowl announcement and press conference in one of the most memorable three-day stretches of my life. To call the 44-7 win at FAU for Troy's seventh win, then to be in the middle of the plane on the way back and find out Middle Tennessee had beaten FIU to give the Trojans a share of their 5th straight Sun Belt title, THEN bellow along with Coach Blakeney as he led the plane in several spirited verses of "Trojans, One and All"... well, that's a mighty fine day, all in all. The R&L Carriers New Orleans Bowl bid was sweet as well, and the media was again on hand at the Courtyard by Marriott for the press conference today. Dawn Railey of the hotel is as Troy as Troy can be, and she proudly presented the guys with a commemorative cake (designed and made --as a matter of fact-- by defensive tackle Emmanuel Dudley's wife) dedicated to Troy's successful quest for the "Drive For Five"! Make sure when you get your tickets (and I know you will) that you get them through Troy University by calling 1-877-878-9467 or getting them online at troytrojans.com. 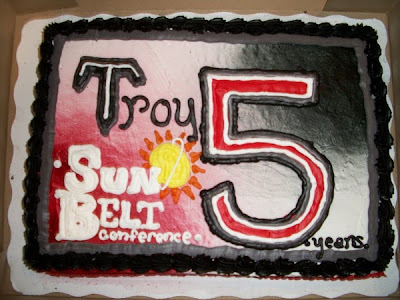 One of the main reasons Troy has gone to so many bowl games for you to enjoy is because Troy has always done a good job of selling tickets to those bowl games. If you don't buy those tickets through Troy, the Trojans don't get to reap those benefits, and you'll have Jonathan Massaquoi to explain yourself to! Comments from the press conference came from Larry Blakeney, QB Corey Robinson (the Sun Belt Offensive Player of the Week), Sam Sellers (the Sun Belt Special Teams Player of the Week), WR's Jerrel Jernigan, Tebiarus Gill, and Jason Bruce, DE Jonathan Massaquoi, and LB Xavier Lamb. One final note: we chad mentioned that last week was the final Trojan Talk scheduled to talk strictly football but, with so much good news and the help and accommodation of AD Steve Dennis and Larry Blakeney, we'll spend Tuesday night's show talking about the bowl, Saturday's win, and the matchup against Ohio. You'll be able to hear Trojan Talk on 94.7FM, WTBF in Troy, and on 960AM, WOOF in Dothan, as well as online. Call in toll-free between 7p-8p at 866-736-5889. We'll be live at Santa Fe Cattle Company in Troy!